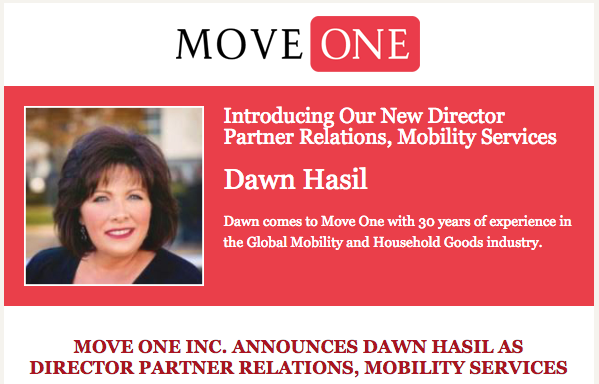 We are pleased to announce, Dawn Hasil will join Move One Relocation, effective January 21, 2019, as Director, Partner Relations Mobility Services. Dawn will be responsible for developing and acquiring new strategic partnerships and managing strategic partnerships with existing key accounts. Dawn will be based in Chicago, Illinois, USA. Dawn comes to Move One with 30 years of experience in the Global Mobility and Household Goods industry. Over the past 20+ years she has held senior level positions in Sirva Worldwide, Allied and North America International and Continuum Relocation. In her most recent position as VP Household Goods and Global Mobility at Hollander International Storage and Moving, she led a successful sales team and managed domestic and global operations with a professional staff of employees. “Dawn joins Move One at a pivotal time of accelerated growth,” says Curt Clements, CEO Move One. Dawn’s experience spans all areas of business operations, including, Profit & Loss, International Sales, Operations Management, New Business Development, Training & Development, Supply Change Management and Procurement. Her wealth of experience and know will bring significant benefit to Move One. Dawn has served on several industry boards and committees, most recently as Chairman of Programs for the Corporate Relocation Council (CRC) Chicago. Dawn holds the Global Mobility Specialist – Talent Mobility (GMS-T) from the Worldwide ERC.